Gian Franco Corsi Zeffirelli, KBE Grande Ufficiale OMRI (Italian: [ˈfraŋko dzeffiˈrɛlli]; born 12 February 1923), best known as Franco Zeffirelli, is an Italian director and producer of operas, films and television. He is also a former senator (1994–2001) for the Italian centre-right Forza Italia party. Some of his operatic designs and productions have become worldwide classics. He is also known for several of the movies he has directed, especially the 1968 version of Romeo and Juliet, for which he received an Academy Award nomination. His 1967 version of The Taming of the Shrew with Elizabeth Taylor and Richard Burton remains the best-known film adaptation of that play as well. His miniseries Jesus of Nazareth (1977) won acclaim and is still shown on Christmas and Easter in many countries. A Grande Ufficiale OMRI of the Italian Republic since 1977, Zeffirelli also received an honorary knighthood from the British government in 2004 when he was created a Knight Commander of the Order of the British Empire. He was awarded the Premio Colosseo in 2009 by the city of Rome. Zeffirelli was born Gian Franco Corsi Zeffirelli in the outskirts of Florence, Italy. He was the result of an affair between Alaide Garosi, a fashion designer and Ottorino Corsi, a wool and silk dealer. Since both were married, Alaide was unable to use her surname or Corsi's for her child. She came up with "Zeffiretti" which are the "little breezes" mentioned in Mozart's opera Idomeneo, of which she was quite fond. However, it was misspelled in the register and became Zeffirelli. When he was six years old, his mother died and he subsequently grew up under the auspices of the English expatriate community and was particularly involved with the so-called Scorpioni, who inspired his semi-autobiographical film Tea with Mussolini (1999). Italian researchers have found that Zeffirelli is one of a handful of living people traceably consanguineous with Leonardo da Vinci. Zeffirelli is a descendent of one of da Vinci's siblings. Zeffirelli graduated from the Accademia di Belle Arti Firenze in 1941 and, following his father's advice, entered the University of Florence to study art and architecture. After World War II broke out, he fought as a partisan, before he met up with British soldiers of the 1st Scots Guards and became their interpreter. After the war, he re-entered the University of Florence to continue his studies, but when he saw Laurence Olivier's Henry V in 1945, he directed his attention toward theatre instead. While working for a scenic painter in Florence, he was introduced to and hired by Luchino Visconti, who made him assistant director for the film La Terra trema which was released in 1948. Visconti's methods had a deep impact upon Zeffirelli's later work. He also worked with directors such as Vittorio De Sica and Roberto Rossellini. In the 1960s, he made his name designing and directing his own plays in London and New York and soon transferred his ideas to cinema. Zeffirelli's first film as director was a version of The Taming of the Shrew (1967), originally intended for Sophia Loren and Marcello Mastroianni but finally including the Hollywood stars Elizabeth Taylor and Richard Burton instead. Taylor and Burton helped fund production and took a percentage of the profits rather than their normal salaries. While editing The Taming of the Shrew, Zeffirelli's native Florence was devastated by floods. A month later, Zeffirelli released a short documentary, Florence: Days of Destruction, to raise funds for the disaster appeal. Zeffirelli's major breakthrough came the year after when he presented two teenagers as Romeo and Juliet (1968). The movie is still immensely popular and was for many years the standard adaptation of the play shown to students. This movie also made Zeffirelli a household name - no other subsequent work by him had the immediate impact of Romeo and Juliet. The film earned $14.5 million in domestic rentals at the North American box office during 1969. It was re-released in 1973 and earned $1.7 million in rentals. Film critic Roger Ebert (1942–2013), for the Chicago Sun-Times has written: "I believe Franco Zeffirelli's Romeo and Juliet is the most exciting film of Shakespeare ever made". After two successful film adaptations of Shakespeare, Zeffirelli went on to religious themes, first with a film about the life of St. Francis of Assisi titled Brother Sun, Sister Moon (1972), then his extended mini-series Jesus of Nazareth (1977) with an all-star cast. The latter was a major success in the ratings and has been frequently shown on television in the years since. He moved on to contemporary themes with a remake of the boxing picture The Champ (1979) and the critically panned Endless Love (1981). In the 1980s, he made a series of successful films adapting opera to the screen, with such stars as Plácido Domingo, Teresa Stratas, Juan Pons and Katia Ricciarelli. He returned to Shakespeare with Hamlet (1990), casting the then–action hero Mel Gibson in the lead role. His 1996 adaptation of the Charlotte Brontë novel Jane Eyre was a critical success. Zeffirelli frequently cast unknown actors in major roles; however, his male leads have rarely gone on to stardom or even a sustained acting career. Leonard Whiting (Romeo in Romeo and Juliet), Graham Faulkner (St. Francis in Brother Sun, Sister Moon) and Martin Hewitt (in Endless Love) all left the film business. The female leads in those films (Olivia Hussey and Brooke Shields) have attained far greater success in the industry. Zeffirelli has been a major director of opera productions since the 1950s in Italy and elsewhere in Europe as well as the United States. He began his career in the theatre as assistant to Luchino Visconti. Then he tried his hand at scenography. His first work as a director was buffo operas by Rossini. He became a friend of Maria Callas and they worked together on a La Traviata in Dallas, Texas, in 1958. Of particular note is his 1964 Royal Opera House production of Tosca with Maria Callas and Tito Gobbi. In the same year, he created Callas' last Norma at the Paris Opera. Zeffirelli also collaborated often with Dame Joan Sutherland, designing and directing her performances of Donizetti's Lucia di Lammermoor in 1959. He has over the years created several productions for the Metropolitan Opera in New York, including La bohème, Tosca, Turandot and Don Giovanni. In November 2004, he was awarded an honorary knighthood by the United Kingdom. In 1996, for services to the arts, he was awarded an honorary degree by the University of Kent at a graduation ceremony held in Canterbury Cathedral. In 1999, he received the Crystal Globe award for outstanding artistic contribution to world cinema at the Karlovy Vary International Film Festival. He has received criticism from religious groups for what they call the blasphemous representation of biblical figures in his films and also criticism from members of the gay community for publicly backing the Roman Catholic Church with regard to homosexual issues. In 1996, Zeffirelli came out as gay, but has since preferred to be discreet about his personal life. Zeffirelli said that he considers himself "homosexual" rather than gay, as he feels the term "gay" is less elegant. Zeffirelli has adopted two adult sons, men he has worked with for years and who now live with him and manage his affairs. Director Bruce Robinson claimed to have been the target of unwanted sexual advances by Zeffirelli during the filming of Romeo and Juliet, in which Robinson played Benvolio. Robinson says that he based the lecherous character of Uncle Monty in the film Withnail and I on Zeffirelli. In 2018, actor Johnathon Schaech alleged that Zeffirelli sexually assaulted him during the filming of Sparrow. Zeffirelli's son Pippo issued a statement denying the allegation. ^ "Search". Retrieved 8 January 2017. ^ Tommasini, Anthony (16 January 2014). "Virtuoso Poignancy Unfettered by Concepts". The New York Times. Retrieved 8 January 2017. ^ "Teatro alla Scala". Teatro alla Scala. Retrieved 2017-01-08. ^ Staatsoper, Wiener. "Search". Retrieved 8 January 2017. ^ BBC News. "UK honour for director Zeffirelli." ^ "Franco Zeffirelli Facts". Biography.yourdictionary.com. Retrieved 2017-01-08. ^ "Leonardo da Vinci's 'living relatives' identified - BBC News". BBC News. Bbc.com. 2016-04-15. Retrieved 2017-01-08. ^ Donadio, Rachel (2009-08-18). "Maestro Still Runs the Show, Grandly". The New York Times. Retrieved 2009-08-18. ^ "Franco Zeffirelli Biography". Yahoo! Movies. Retrieved 2009-08-18. ^ "Burton Hosts Flood Special on Channel 33". Gettysburg Times. 31 December 1966. Retrieved 29 December 2012. ^ Ebert, Roger (15 October 1968). "Romeo and Juliet". RogerEbert.com. Roger Ebert. Retrieved 17 January 2014. ^ Smith, Patricia Julian (9 January 2005). "Zeffirelli, Franco". glbtq: An Encyclopedia of Gay, Lesbian, Bisexual, Transgender and Queer Culture. Archived from the original on 14 August 2007. Retrieved 7 August 2007. ^ Barbara McMahon (21 November 2006). "Zeffirelli tells all about priest's sexual assault". The Guardian. ^ a b "Franco Zeffirelli". New York Times. Retrieved 2012-12-29. ^ Murphy, Peter. "Interview with Bruce Robinson". Archived from the original on 7 July 2007. Retrieved 7 August 2007. ^ Schaech, Johnathon (January 11, 2018). "Actor Johnathon Schaech: I Was Molested by Director Franco Zeffirelli". People. ^ "Director Franco Zeffirelli, 94, accused of molesting actor in 1992; son denies it". ^ a b c d e f g h i j k l m n o p q r s t u v w "Franco Zeffirelli Filmography". Allmovie. Retrieved 2009-08-18. 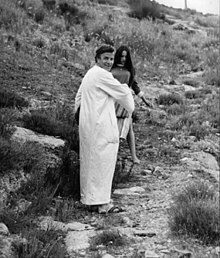 Wikimedia Commons has media related to Franco Zeffirelli. "Franco Zeffirelli collected news and commentary". The New York Times.